The past 30 years since the adoption of ‘open door policy’ have witnessed great advances in astronomical studies at NAOC, especially in the last decade since ‘Knowledge Innovation Project’ was initiated. Aiming to meet the nation's major strategic needs, five projects (titles to be confirmed by research groups) led by researchers from NAOC are supported by "973" Program (National Keystone Basic Research Program) of Ministry of Science and Technology. These projects help strengthen the original innovations and to address the important scientific issues. 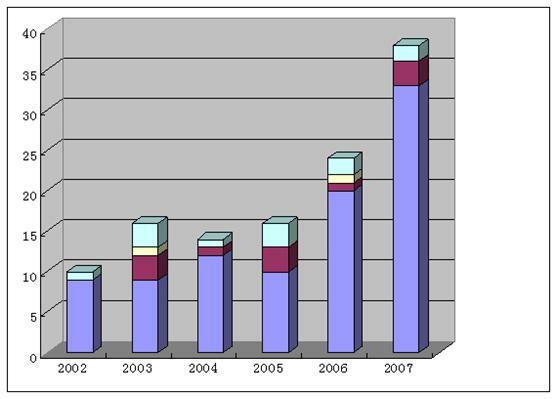 The number of research grants and funds awarded to NAOC from the National Natural Science Foundation of China (NSFC) during the 2005-2007 academic years has doubled compared to that of the 2002-2004 period. Seven National Awards have been awarded to researchers at NAOC for excellence in astronomy research and related technological innovation. Showcased below are some of the achievements that have been awarded in recent years. “Probing the Mass Distribution of the Universe With Gravitational Lensing” found a steep mass profile toward the central regions of clusters of galaxies, used the statistic properties of giant arcs as a probe to measure the cosmic density parameter and cosmological constant, and discovered a mass dicrepancy in the central cores of clusters between gravitational lensing and conventional method. “Explore the Magnetic Fields of our Milky Way Galaxy” has revealed the properties and structures of the Galactic magnetic fields, and has greatly enriched our knowledge of dynamics of interstellar medium, star formation, origin and transportation of cosmic rays. “The Study of Galactic Chemical Evolution Through Stellar Abundances” indicates that Galactic evolution is accompanied by complicated physical processes, and En route, a new formula for calculating the non local thermal equilibrium effect of neutral hydrogen collisions is given for the first time, which dramatically improves the accuracy of abundance determination of several specific elements. The numbers of published SCI papers, citations, and cited papers are increasing steadily. A national large-scale science project, Large Sky Area Multi-Object Fiber Spectroscopy Telescope (LAMOST) was completed in 2008, and is now in the commission period. The innovative concept and technology development (active optics for both thin mirror and segmented mirror on the Schmidt corrector MA, parallel controllable fiber positioning system) make it feasible to fulfill the requirements of a large aperture and a wide field of view (FOV) simultaneously. Equipped with this large FOV optics and up to 4000 fibers on the focal plane, this 4.8m/6.1m meridian reflecting Schmidt telescope promises an unparalleled observing efficiency and a wealth of new discoveries. It will prove invaluable in understanding the structure and evolution of the universe, and of our own Galaxy as well. 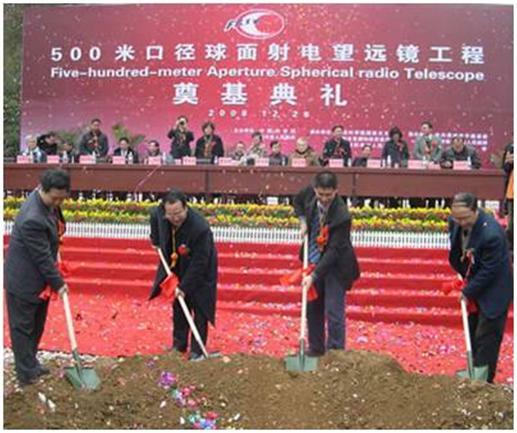 The official ground-breaking ceremonies of another national large-scale science project, Five-hundred-meter Aperture Spherical Telescope (FAST), took place in late 2008. It uses the Unique Karst depression as the site and the collecting area of FAST is 30 times larger than a standard football pitch. When finished, it will be the world’s largest single-dish radio telescope. It will provide astronomers the otherwise unattainable tools and resources to detect galaxies at unprecedented distances and faint fast-period pulsars. 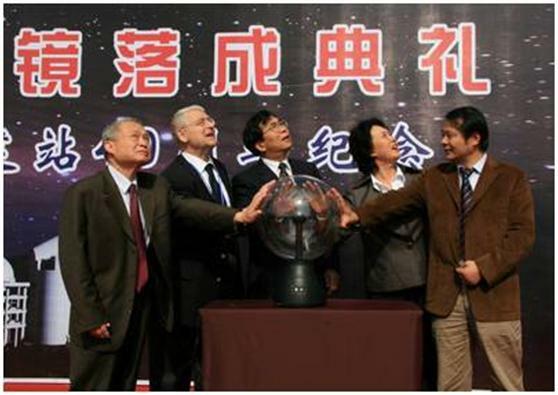 NAOC is also involved and plays an important role in China’s Lunar Exploration Program. The ground segment for data, science and applications is built and operated by NAOC. The 50-m and 40-m radio telescopes serve as data downlink stations; both two and another NAOC’s radio telescope in Urumqi are in the VLBI network. China’s first lunar map is also constructed at NAOC.